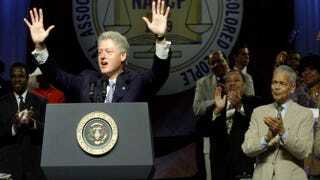 Then-President Bill Clinton receives applause during his address in July 2000 at the 91st convention of the NAACP in Baltimore. Looking on at right is then-NAACP Chairman Julian Bond. Philadelphia, Wed., July 15: In an address to the nation’s oldest civil rights organization, former President Bill Clinton offered a mea culpa for signing a criminal-justice reform bill into law during his two-term presidency. Clinton’s comments came a day after President Barack Obama addressed NAACP delegates. Earlier in the week, Obama commuted the prison sentences of 46 nonviolent drug offenders, saying that they were not “hardened criminals” and that their long sentences didn’t fit the crimes. It’s unclear if Clinton’s confession will help his wife, Hillary Rodham Clinton, who is running for president in 2016. Neither Hillary Clinton nor any of her Republican or Democratic rivals attended the five-day convention. But some conventiongoers were suspicious about Clinton’s motives. In an interview with The Root, NAACP President Cornell William Brooks said that reforming the criminal-justice system has been one of the NAACP’s major goals for years. He said that ending racial profiling and tackling mass incarceration will undoubtedly become major topics in next year’s presidential debates. Next month, Brooks will lead America’s Journey for Justice, an 860-mile march from Selma, Ala., to Washington, D.C., in an effort to train a spotlight on the criminal-justice system, voter disenfranchisement, high unemployment and inequities in public education. At the same time, Brooks said that the civil rights group has to be more intentional about bringing younger activists into the fold. For years, NAACP officials have struggled over how best to counter criticisms that the organization founded in 1909 by W.E.B. Du Bois, Ida B. Wells and others has lost its relevance and its connection with the younger generation. But that was a lesson that even Brooks had to learn in Ferguson, Mo., in the days after Michael Brown’s death. During a planned NAACP march from Ferguson to the state Capitol in Jefferson City to protest Brown’s death, Brooks urged young protesters not to use their mobile devices to film the march, in fear that the marchers would anger white supremacist groups. The young protesters ignored Brooks’ plea and filmed the march and uploaded the footage to the Internet. Brooks said that legislation that calls for the end of racial profiling and body cameras on police officers are issues that can unite activists across generations. Jamal Watson is the senior staff writer for Diverse: Issues in Higher Education and the author of a forthcoming biography of the Rev. Al Sharpton. Follow him on Twitter.